Inspection of 81 garment factories conducted by the 23 special inspection teams of the Department of Inspection of Factories and Establishments of the government of Bangladesh found labour rights and safety standards below the required level. Some important compliance issues, such as formation of trade union, insurance facility for the garment workers, daycare centre, maternal welfare, participation committee, safety record book and safety committee etc. have not been addressed satisfactorily, according to the department. Of the inspected factories, some 51 are the members of Bangladesh Garment Manufacturers and Exporters Association (BGMEA), 9 are the members of Bangladesh Knitwear Manufacturers and Exporters Association (BKMEA) respectively and 21 are not member of any association in Bangladesh. Bangladesh had pledged to strengthen workers’ rights, in particular the Freedom of Association and Protection of the Right to Organise (ILO convention No. 87), Right to Organise and Collective Bargaining (ILO convention No. 98), structural integrity of the factory buildings and to improve occupational health and safety of the workers. Independent research shows that Bangladesh took some initiatives only due to tremendous pressures from the European Consumers and Public in general but greatly failed to deliver it’s commitments made in the EU-Bangladesh Global Sustainability Compact, most importantly due to the fact that about 10 per cent of Bangladesh’s lawmakers are garment factory owners and at least half of the MPs have some sort of business links to the RMG sector and finally, the garment factory owners are the biggest donors to the political parties in Bangladesh. Therefore, it is near to impossible implementing any reform in the RMG sector compromising their interests. Bangladesh failed to deliver on most of the commitments, according to the working paper for the Meeting on GSP, Presided over by the Commerce Minister. At least half of the garment factories in Bangladesh did not pay the new wage scale effective from 1st December 2013, according to the media reports. Recruitment of 200 additional inspectors by the end of 2013 was not achieved. Only 40 were recruited, according to the media reports. Ensuring the Right to Organise through formation of trade union in the (military run) Export Processing Zones (EPZ) in conformity with Bangladesh Labour (amendment) Act 2013. It is one of the major requirements of the United States of America. The EPZs are governed by a separate agency, the Bangladesh Export Processing Zones Authority, and by separate laws. By tradition, the authority has been run by a military officer, active duty or retired, and many factories have hired retired soldiers to oversee security. Ensuring the structural integrity of the factory buildings and to improve occupational health and safety of the workers by June 2014 has also not seen any solid advancement within the stipulated timeframe. 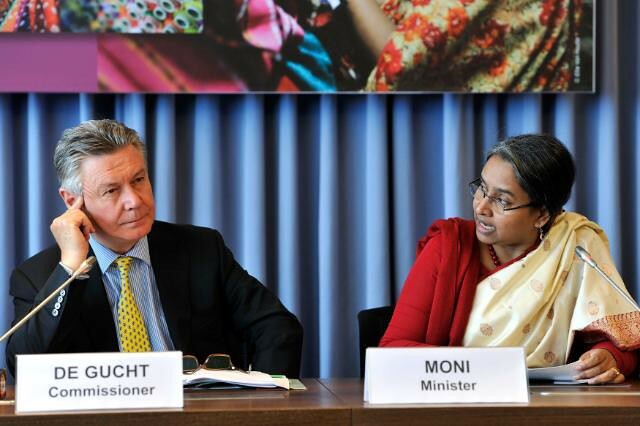 The European Union is not satisfied with the progresses Bangladesh has made to improve workplace safety in the apparel industry, according to the EU Ambassador (Head of Delegation of the European Union) to Bangladesh. He was speaking on progress in RMG sector in Dhaka on the March 09, 2014. “A few changes are happening. But lots of things need to be done,” he told reporters after a programme “Lives beyond machines — a reflection on priorities for women in the RMG sector” organised by CARE Bangladesh at Cirdap auditorium in the city. The EU is Bangladesh’s leading trading partner. The country’s total exports to the EU amounted to around US$ 13 billion in fiscal year 2012-13. Some 90 per cent of Bangladesh’s exports to the EU are ready-made garments, corresponding to 60 per cent of Bangladesh’s total apparel exports. As a least developed country (LDC), Bangladesh benefits from the most favourable regime available under the EU’s Generalised Scheme of Preferences (GSP), namely the Everything But Arms (EBA) arrangement. The EBA grants the 48 LDCs — including Bangladesh — duty and quota-free access to the EU for exports of all products, except arms and ammunition. However, in order to continue to benefit from this scheme, certain legal conditions have to be met: human and core labour rights must be respected. It is important, therefore, that Bangladesh shows sustained progress in improving its labour rights and working conditions in line with core ILO conventions.